Dean Brockman no long the Blades head coach. Two years of struggling down the stretch have cost Dean Brockman his position with the Saskatoon Blades. On Sunday a day after their regular season concluded, the Blades announced Brockman has been relieved of his duties as head coach immediately. Blades general manager Colin Priestner said the decision came due the fact the Blades were holding a playoff position late in the season over the past two campaigns only to miss the post-season. With five games remaining on their regular season schedule in 2016-17, the Blades held a three-point edge over the Calgary Hitmen for the last playoff berth in the WHL’s Eastern Conference. The Blades won one of their final five games, while the Hitmen claimed five of their last six regular season contests to vault into a playoff berth. During this past season, the Blades held an eight point lead over the Prince Albert Raiders for the second wildcard spot when action concluded on Feb. 19. The Blades were two points behind the Brandon Wheat Kings for the first wildcard position. The Blades had 11 games remaining on their regular season schedule, while the Raiders and Wheat Kings had 13 contests each to play. Saskatoon posted a 4-6-1 record over those final 11 contests, which included a season ending three-game winning streak. The Raiders went 9-2-0-2 to leap into the second wildcard spot, and the Wheat Kings held the first wildcard spot going 9-4. “I felt we faltered, and I think some of the habits that were created and developed throughout the year showed themselves a little bit in those big important games,” said Priestner. “It is a results based business, and unfortunately, we didn’t meet the expectations, which is we feel the fans deserved a playoff team. I feel we have a playoff level team. The Blades have missed the WHL’s post-season for five straight years, which is the team’s longest playoff drought in its history. Dean Brockman works the Blades bench. During the 50-year-old’s run as head coach, the Blades posted a 63-68-10-3 record. Brockman is credited with 62 of those victories having to miss one of those wins to attend a funeral. The Blades posted a 35-33-3-1 mark this past season to finish three points behind the Raiders (32-27-9-4) for the second wildcard spot in the Eastern Conference. Saskatoon actually ranked seventh overall in the 12 Eastern Conference due to its point total. With the record the Blades posted this season, they would have made the playoffs in 2015-16 and 2016-17 if they had posted the same mark in those campaigns. Due to the WHL’s playoff format where the top three teams in each division and the two best records after that in each conference make the playoffs, the Blades missed the post-season finishing sixth in the East Division. Priestner said talks were going on the past 10 days on what to do if the Blades missed the post-season. An actual parting of ways didn’t become clear until following the Blades 5-4 victory over the Raiders at the SaskTel Centre to end the regular season for both clubs on Saturday night. “Last night, Dean (Brockman) and I had a conversation after the game,” said Priestner. “We spent an hour talking about things. The decision caught Blades sophomore centre Chase Wouters, who will entering his 18-year-old season in the upcoming campaign, off guard. Wouters elected to not answer questions regarding coaching style. He said the fact the Raiders rolled off a nine game winning streak was really what did in his club’s playoff hopes. When asked of the Blades were feeling heighten stress over their last 11 games to help cause their struggles, Priestner wasn’t sure if that was the fact that caused his club to fall out of a playoff position. 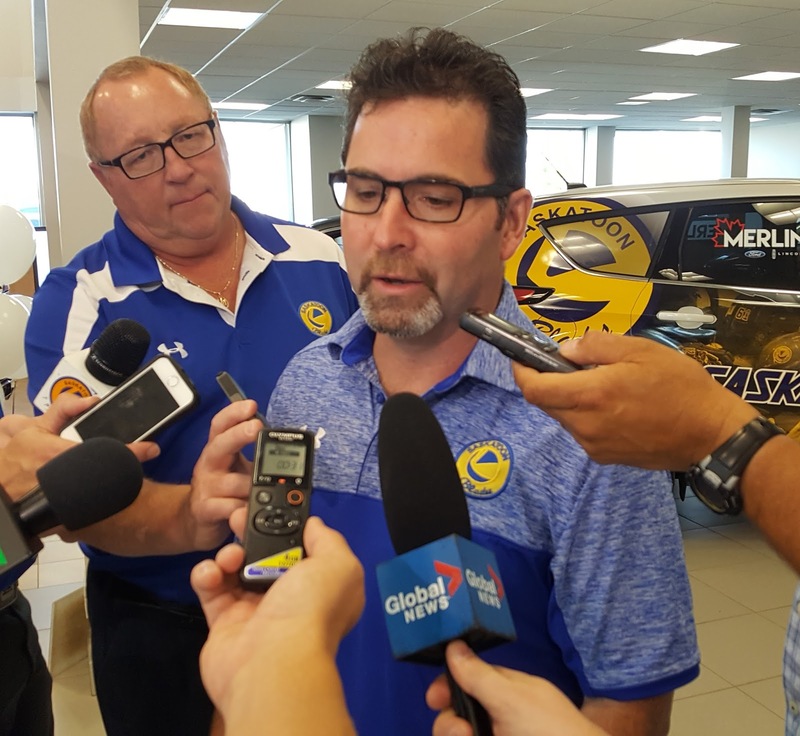 “It is stressful, when you come into a team rebuilding a team,” said Priestner. “It is stressful when you haven’t made the playoffs in a few years, and it amplifies itself. “I am sure there was lots of stress. We all feel stress. We want to do well for this city. Dean Brockman takes part in an old Blades press conference. Priestner noted there was one upswing over the club’s last stretch of 11 or 12 games. Before the season started, Brockman along with assistant coaches Bryce Thoma and Ryan Keller all had their contracts extended to the end of the 2019-20 campaign. Priestner said no decision has been made on the fates of Thoma, Keller, veteran assistant coach Jerome Engele or goaltending coach Tim Cheveldae. Priestner added there is no timeframe to hire a new head coach as the decision to part ways of Brockman just became a reality and there were no candidates on who could possibly become the team’s next head coach.